Here is the source of the natal data for George W. Bush. Let's suppose we don't have the horoscope, so we'll have to interpret firdaria according to the general signification of planets. We'll decide then that firdar of Mercury was about movement and communication, firdar of the Moon was in general more important than the others, since the Moon is a luminary, and Bush most probably dealt with women and family matters then. Saturn is a planet of concentration and limitations, so that period could have been a bit more difficult than the previous, but also, since Saturn is a social planet, society probably played a significant role in Bush's life during this period. Jupiter is a Great Benefactor, the planet of expansion and abundance, so we can expect that the period of life associated with Jupiter was significant, and again, since this is a social planet, society played a major role in that period of life of George W. Bush. Finally, Mars, which is considered to be a malefic planet, marks the period that will probably offer significantly less opportunities than the firdar of Jupiter. Looks logical, doesn't it? Now let's have a look at some of the facts from the biography of George W. Bush. You will find an abbreviated version of his biography on the page with the natal data referenced above. First thing we might notice is that Bush was elected as a President in 2000 and 2004, and both these years are withing his firdar of Jupiter. He lost the elections of the year 2008, close to the end of this lucky firdar, and I've noticed that firdars as if lose their power somewhat earlier than they end. Bush called the years 1968 to 1973 his wandering years, quite appropriately for a firdar of Mercury. The firdar of the Moon has started on the 6th of July 1977, and Bush got married on the 5th of November of the same year, three months after meeting his future wife. This looks to me quite amazing: as soon as the firdar of the Moon has started, within a few months he met his wife, married her and became a family man! There is another very interesting detail in the biography: in 1986, just after his birthday, Bush quit drinking suddenly. On that same birthday, his Saturn firdar has started, and Saturn is the planet of sobriety! As you can see, we were able to retrieve from firdaria some highly relevant information even though we use nothing else but the general meaning of the planets. Now, let's take into consideration some of the details of the natal chart. We will notice that the Moon and Jupiter are in conjunction with each other. This adds significance to their both firdaria since Jupiter is a Great Benefactor (good for the firdar of the Moon), while the Moon is a luminary (good for the firdar of Jupiter). George spent some footloose years after college before settling into responsible marriage and politics. He entered Yale in 1964 and when Vietnam loomed, joined the Air National Guard. During his later campaigns for President, aspects of his National Guard service were questioned, specifically whether he had in fact received special preference as son of a Congressman and whether he had satisfactorily completed the requirements and obligations of his National Guard service. He called 1968 to 1973 his "wandering years," working on a senate campaign, trying out sales, as a youth advisor to inner-city kids, along with a high share of drinking and carousing. 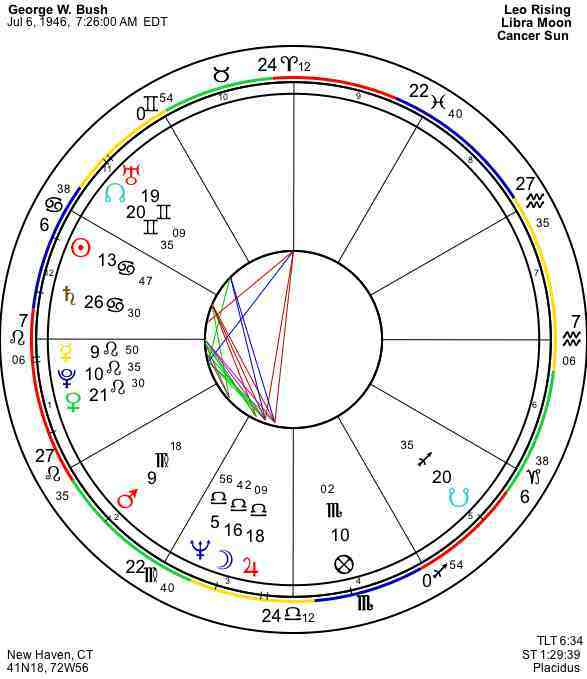 Also we might notice that the Moon is situated in the third house of reading and learning, while Jupiter in a close conjunction with the Moon is often associated with religion and the God. We can then find highly appropriate the information that Bush's wife was a devout west Texas school librarian, and that under her influence he learned to read and talk about the Bible. The bottom line for this case is that you can retrieve a lot of information from firdaria simply using the general meanings of planets, but when you know the natal chart, you will get a more detailed information complementing the general picture, and the more details of the horoscope you take in consideration, the more information you will retrieve.